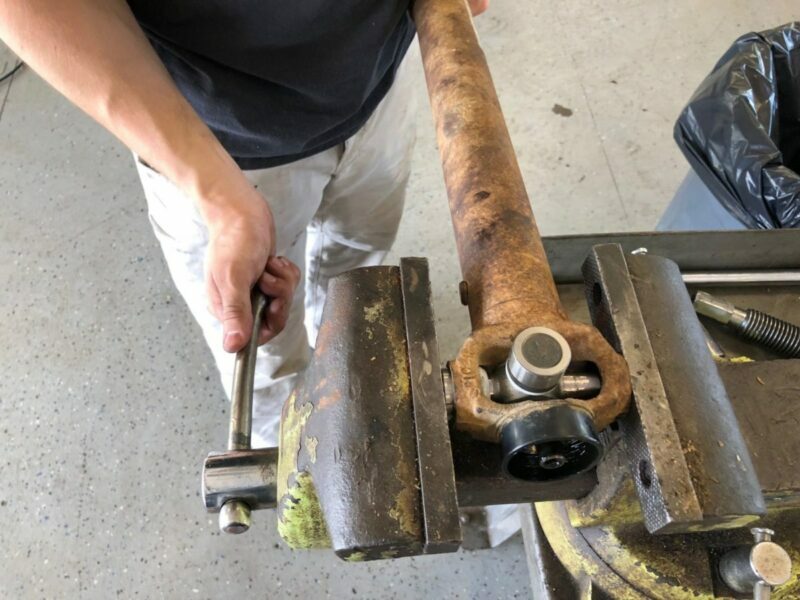 There are a million reasons you should want to know how to rebuild a driveshaft. 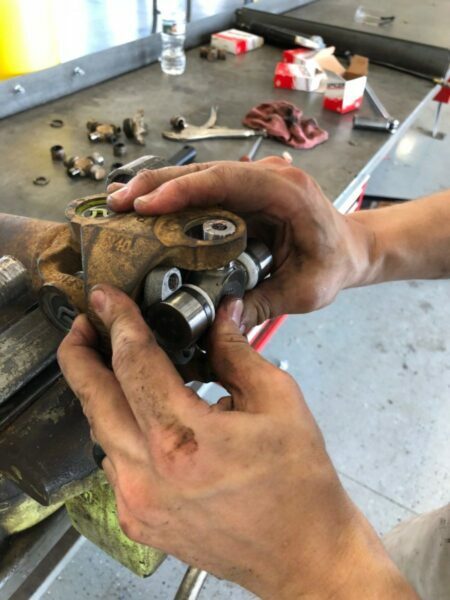 Maybe you’ve been driving around and it sounds like there’s a nest of angry birds chirping from beneath your vehicle, maybe you’ve started noticing a vibration from the driveline, or maybe you even pulled an old, nasty driveshaft from a junkyard and want to have a good trail spare. 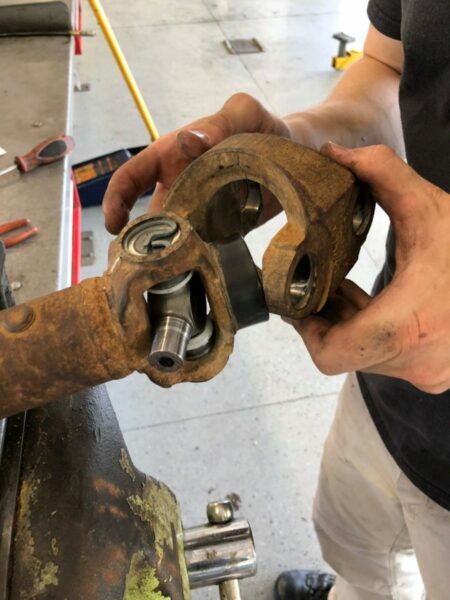 Whatever your reason, we always encourage increasing your knowledge base when it comes to vehicle components, especially those that will inevitably wear out or are prone to failure.We recommend you gain some understanding one of the most common joints found on solid axle off-road vehicles, the universal joint, or u-joint for short. Check out our guide here. 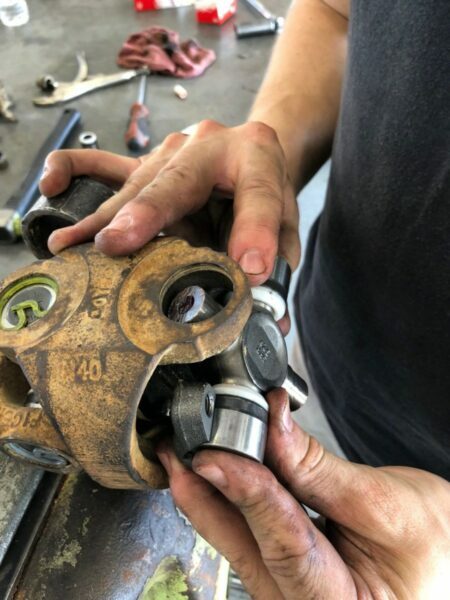 The double cardan joint that we will be rebuilding in this article is a near constant velocity joint. 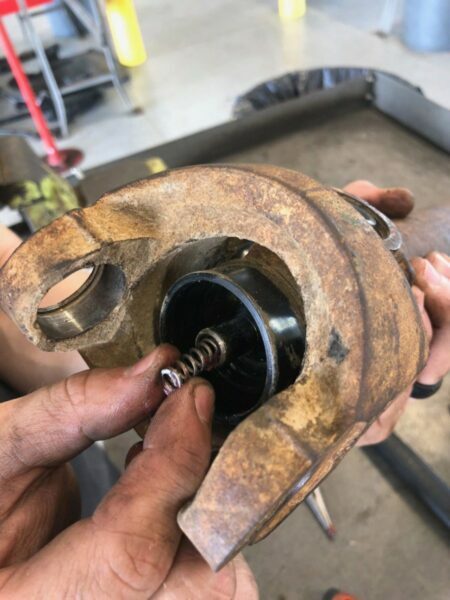 It is often referred to simply as a CV joint. 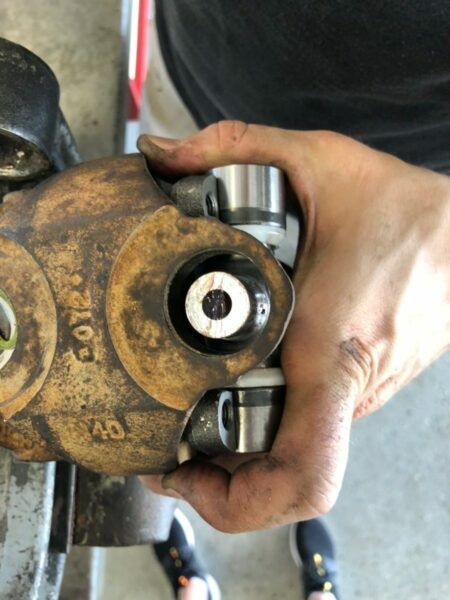 It is comprised of two u-joints and a centering assembly that enables us to use our driveshafts at the angles necessary for the smooth and proper operation of lifted vehicles. 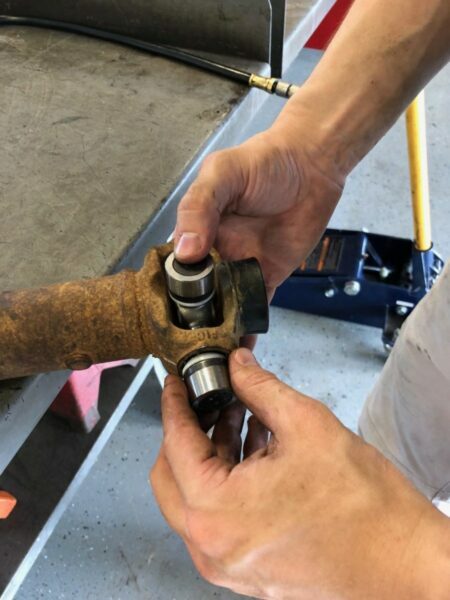 A more conventional two joint driveshaft found on many stock vehicles is limited by the amount of movement a single u-joint allows. 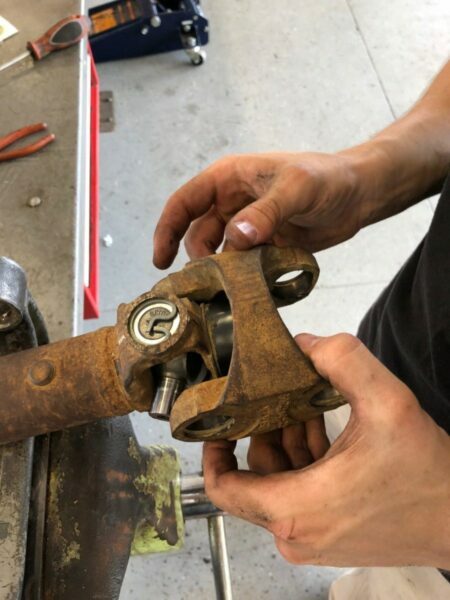 The double cardan joint driveshaft is going to be the most common type of driveshaft you will find on lifted vehicles and even if you have a conventional driveshaft this guide will help you rebuild that as well since it is a simpler assembly. 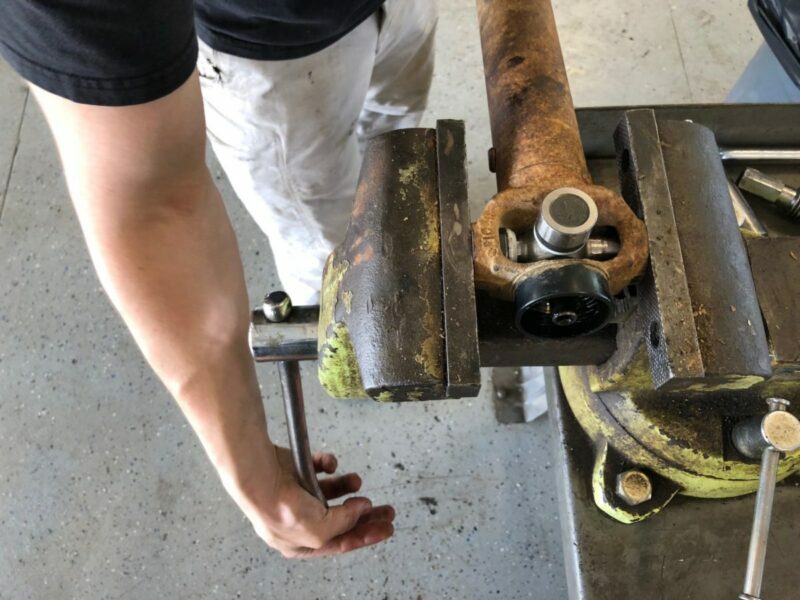 Overall rebuilding a double cardan driveshaft is a simple task that most people can do and only requires about $100 in parts, some basic tools, a few hours of your time, and lots of patience. 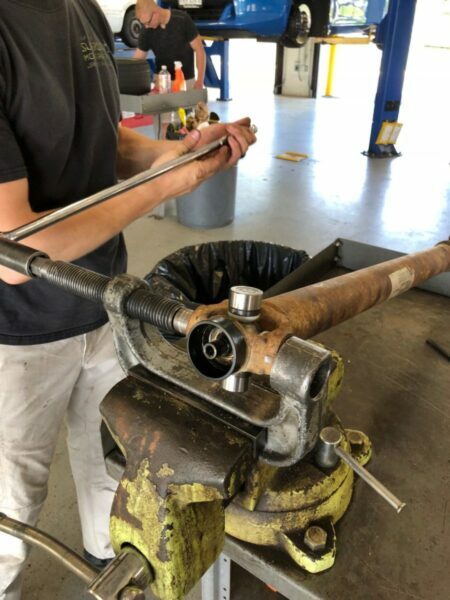 The amount of time and patience this project requires is highly dependent on the amount of rust and corrosion the driveshaft has but on average I’ve found that it takes about three hours from start to finish. 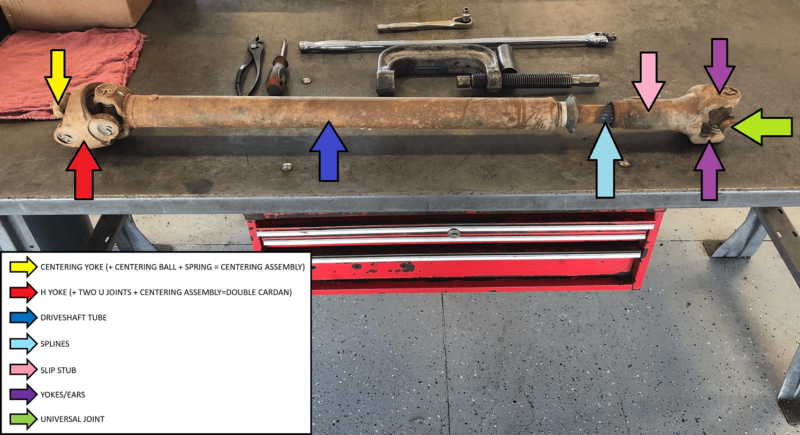 Place the vehicle on a lift or jack in a manner that allows you to turn the driveshaft. 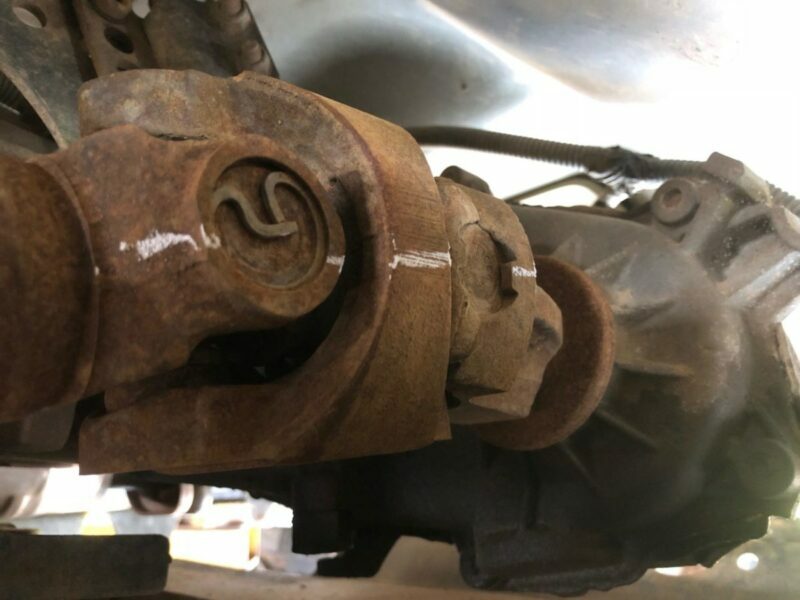 Depending on your application this may require you to place the transfer case in neutral. As always, be safe and there is no such thing as an excessive use of jack stands or wheel chocks. 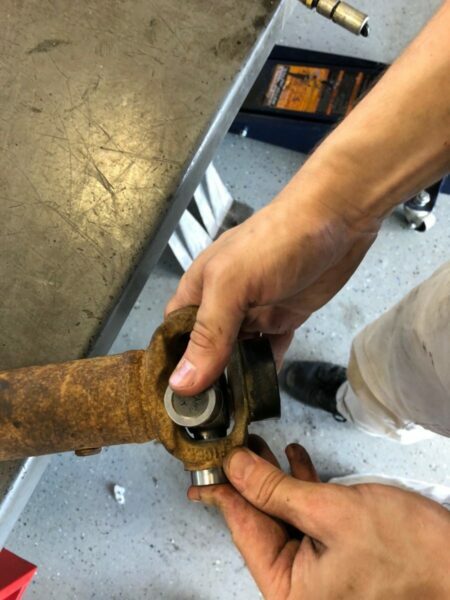 Mark the output flange on the transfer case, the H yoke, the driveshaft yoke at both ends, and at the pinion yoke at the differential. 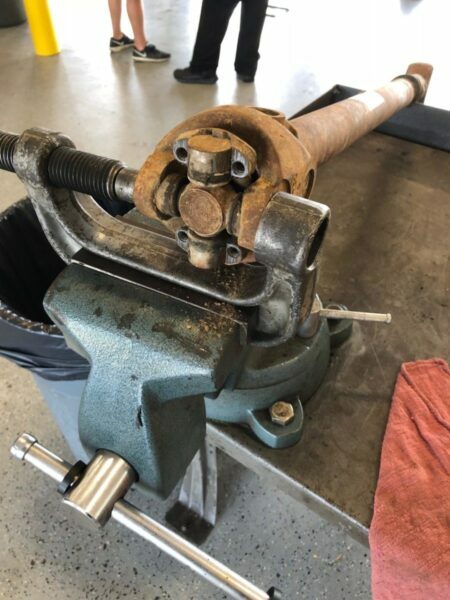 It is necessary to use reference marks along the entire driveshaft assembly because they are balanced and in theory if you can put it all back together the same way it came apart there will be no new vibrations when you mount it back on your vehicle and no need to have the driveshaft rebalanced. 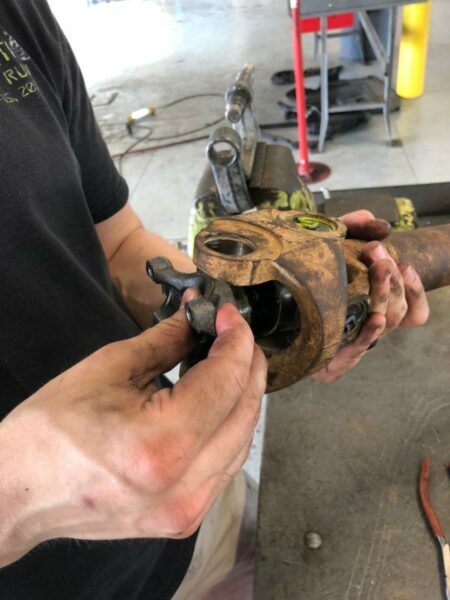 Disconnect the drive shaft form the transfer case. 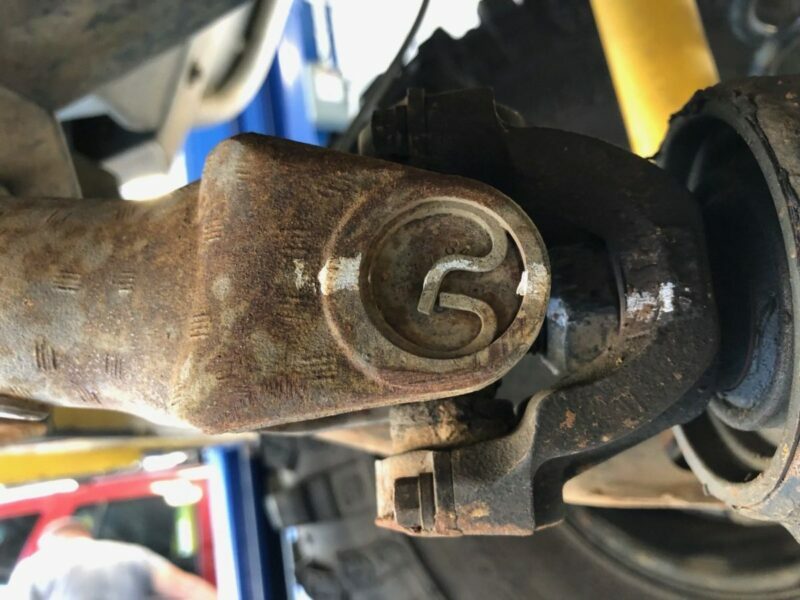 This is normally four to eight bolts, but every vehicle is different. 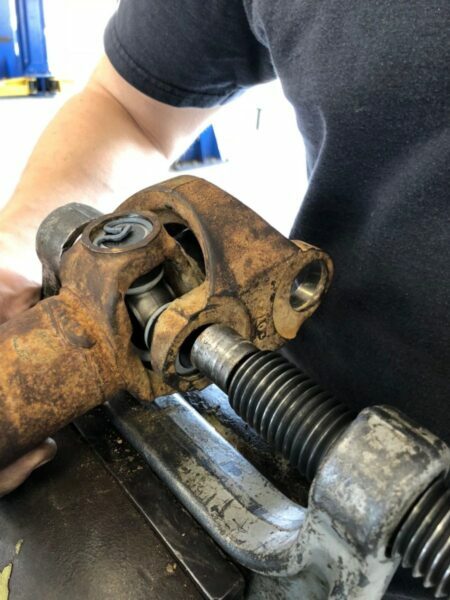 The reason I disconnected the transfer case side first is it normally allows me to set the driveshaft on the transfer case skid, cross member, or my shoulder while I then proceeded with the next step of disconnecting the axle side. 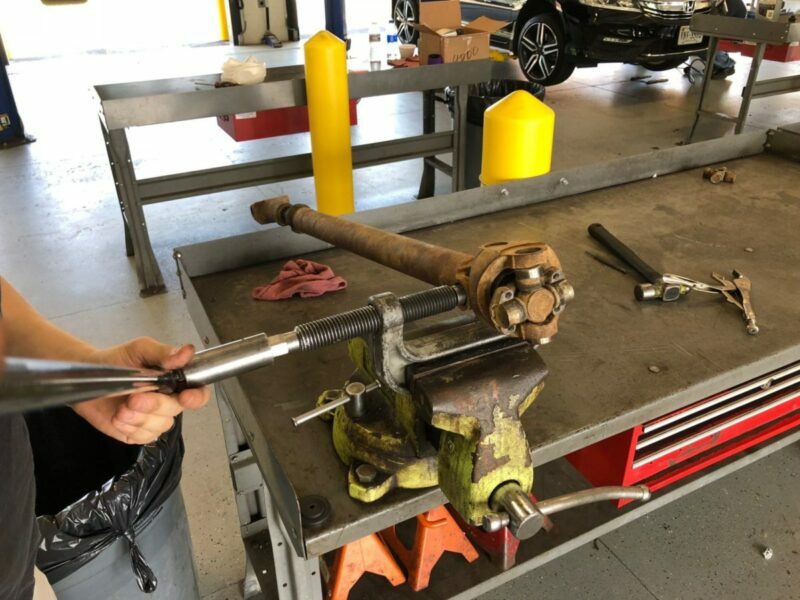 If your vehicle is low to the ground it may be easier to start with the opposite side and let the driveshaft rest on the ground. 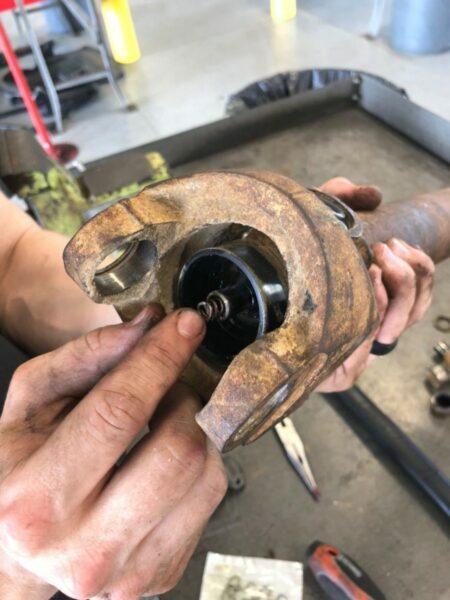 Disconnect the front driveshaft from the axle. 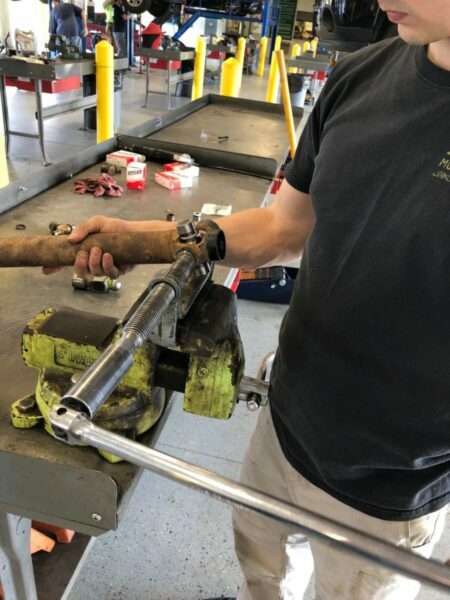 This can be u-joint straps, u-bolts, or a flange set up where all the caps are pressed into solid yokes. 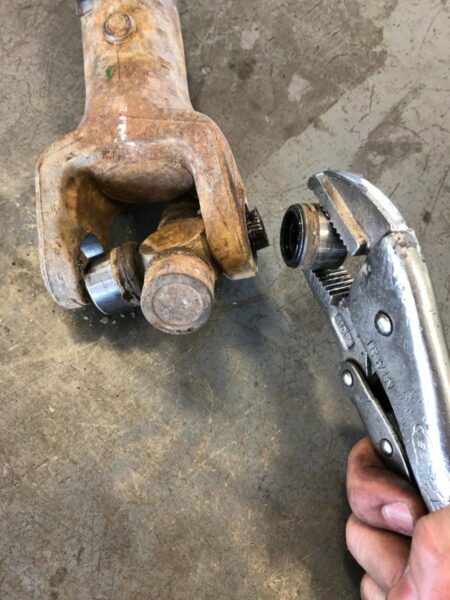 If you find that even with the bolts removed you cannot disconnect the driveshaft do not be afraid to employ the use of a hammer or a tool to leverage things apart. Make sure once you disconnect this side you do not let the drive shaft go past full extension allowing the spline stub to separate from the rest of the driveshaft tube (varies by application, some driveshaft’s have caps or boots that limit extension under normal conditions). 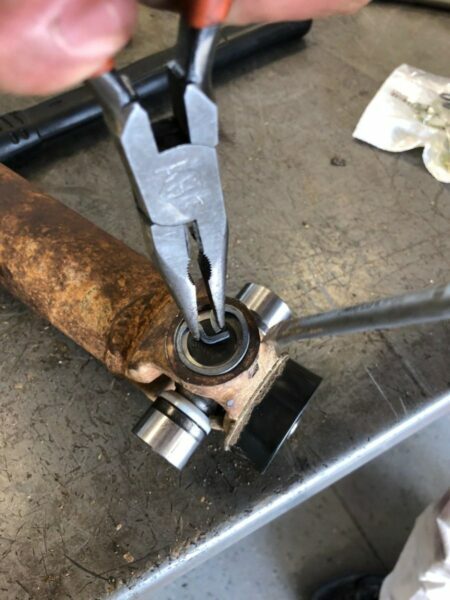 Remove all clips from the ends of all the u-joints along the assembly. 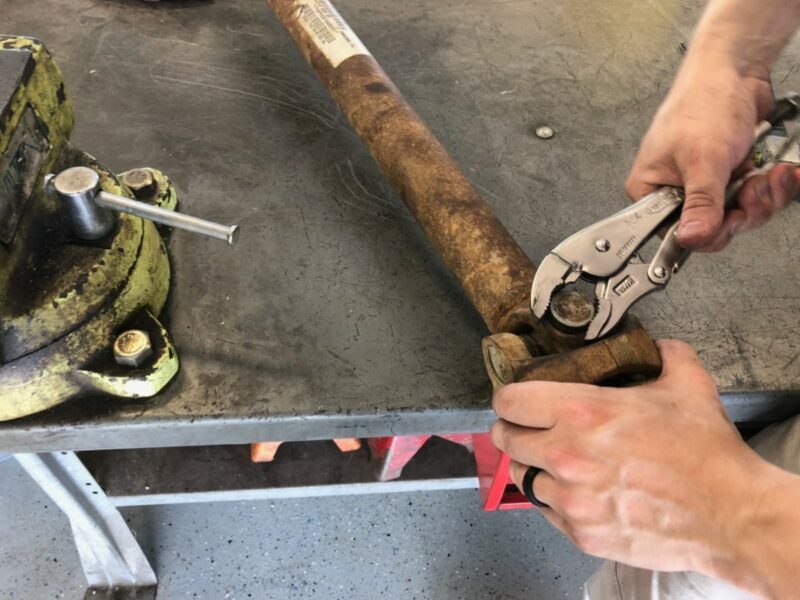 This normally just requires the use of a set of pliers and a screw driver, but in cases of extreme rust or corrosion it may require some penetrating fluid, a hammer, and punch. 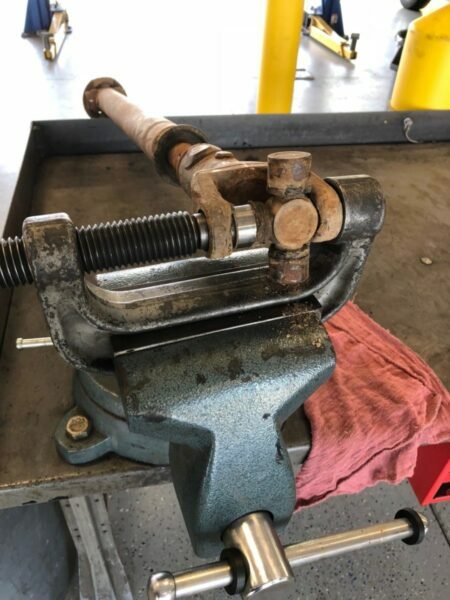 Place your u-join tool in a vice and press out the u-joints one side at a time. 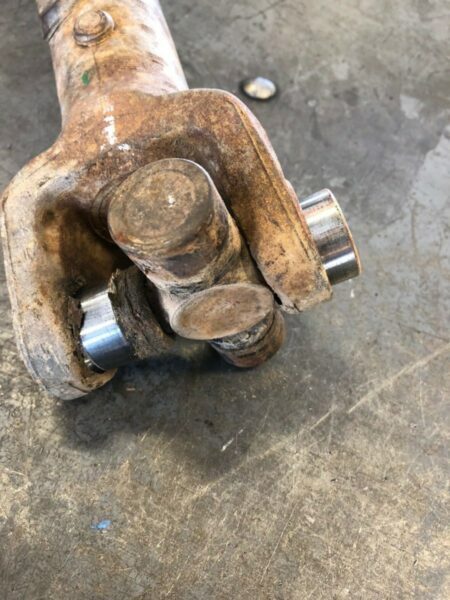 It does not matter in what order you press the u-joints out. You will only be able to push the cap on the opposite side that you are pressing roughly half way out. 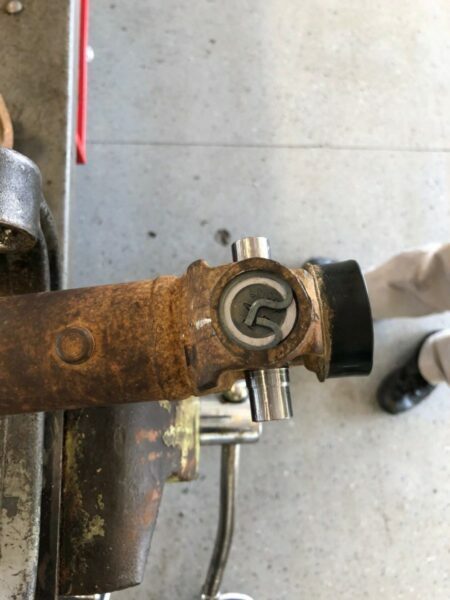 Remove the cap from the side of the u-joint you just pressed out. 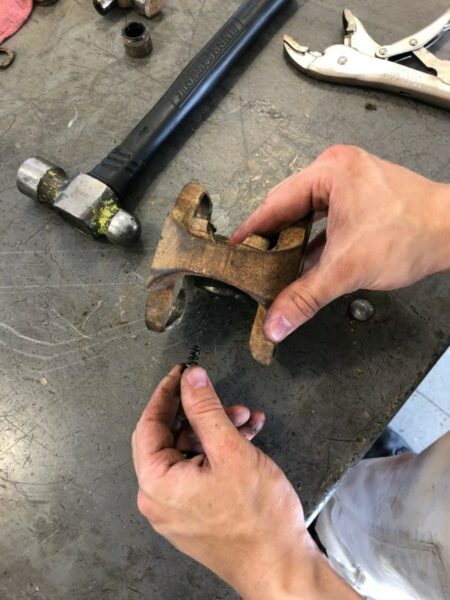 This will probably require the use of vice grips or a good set of pliers to grip the part of the cap extended outside of the yoke. If you have trouble removing the cap you may have to then press it in the opposite direction and try the other side first. 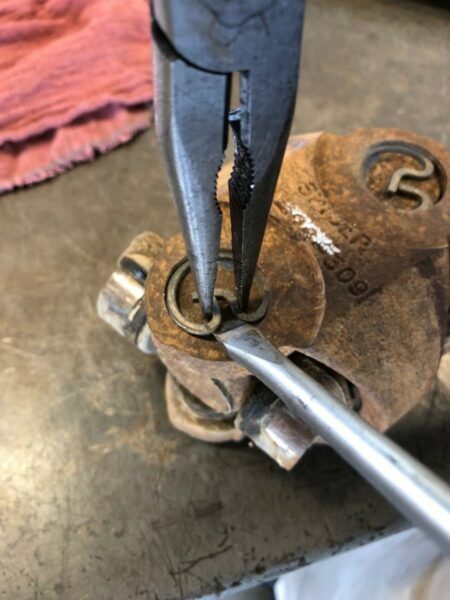 In extreme cases I’m told you can punch the cap out from the inside of the yoke by striking where the needle bearing and cap ride, just be careful not to damage the yoke. 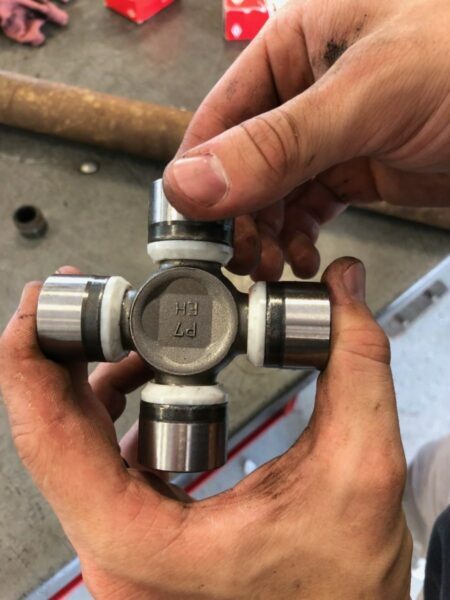 With the caps removed you will be able to move the u-joints out of their yoke. In some cases you will be able to remove them after removing only one cap. 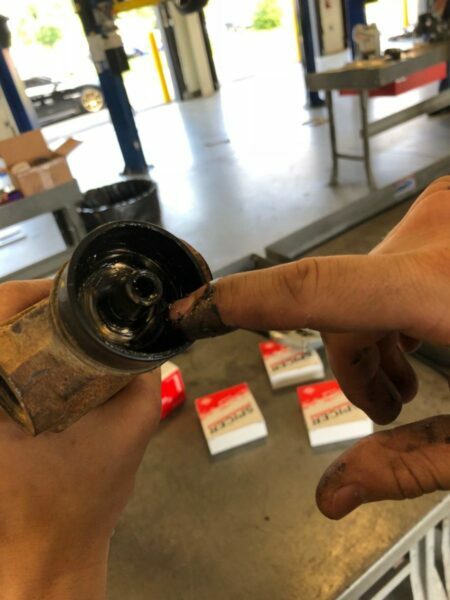 If you have managed to remove your u-joint without damaging it and it appears to be in working condition you may want to keep it around as a trail spare. Repeat steps 6-8 for all u-joints. 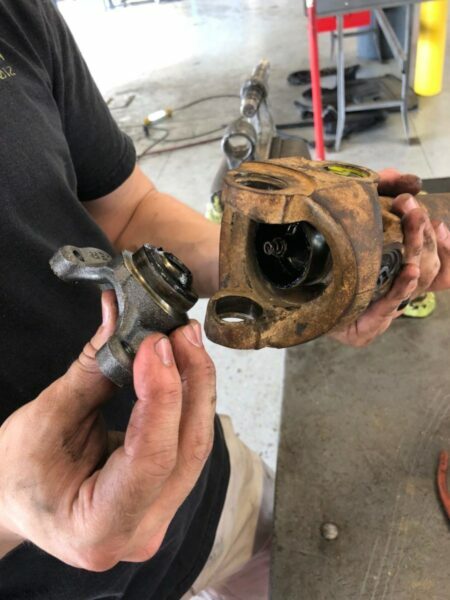 Once the outermost u-joint on the transfer case side is removed the socket yoke should simply fall out. 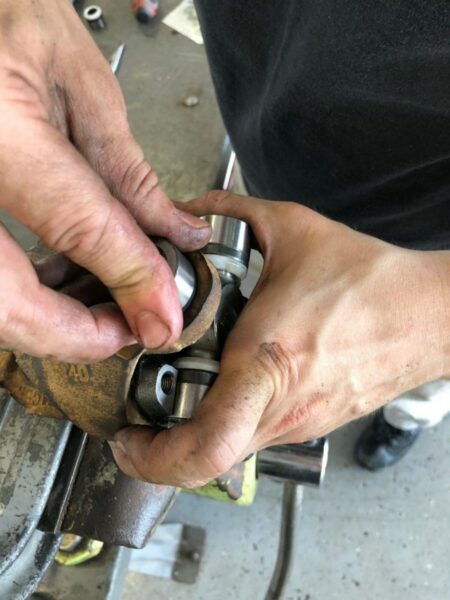 If you are rebuilding the ball centering unit rather than replacing it that there is a small spring located in the ball centering unit that you may need to reuse. Clean and grease parts as necessary prior to reassembly. 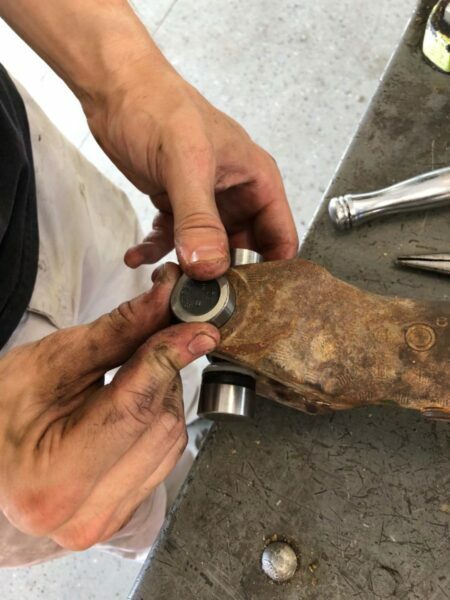 The socket yoke can be greased after assembly with a u-joint needle adapter and the u-joints themselves should either come pre-greased or with a zerk fitting. 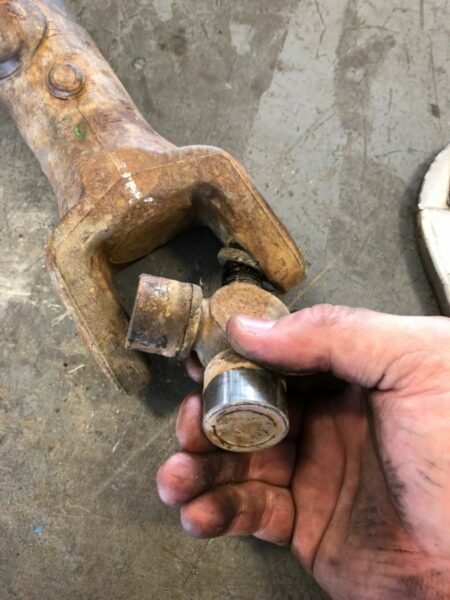 Remove two caps from the u-joint at opposite ends by pulling straight out. Place these caps aside careful not to disturb the needle bearings inside. 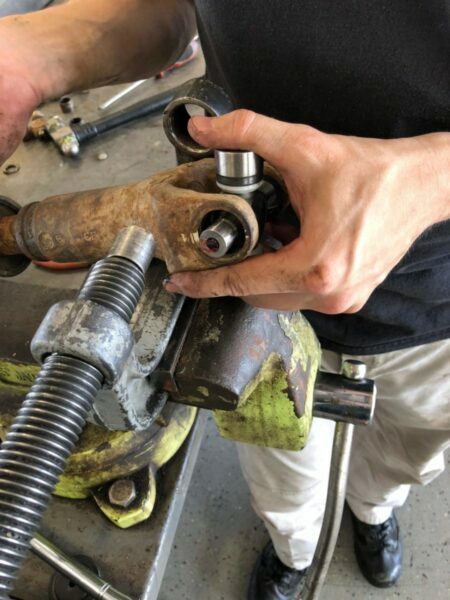 Insert the stubs or arms of the u-joint without the caps into the driveshaft tube yokes on the transfer case side (the side near the dust cover where the H yoke will go). 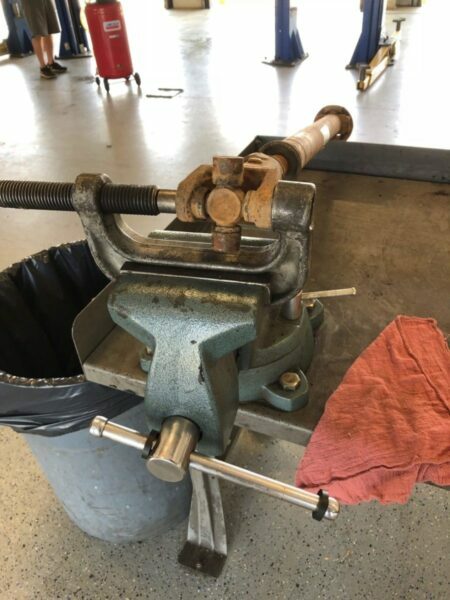 Keeping the u-joint stubs in the center of the yoke carefully place on a cap without disturbing the needle bearings. You should be able to easily slide the cap on by hand at least a third of the way into the yoke. 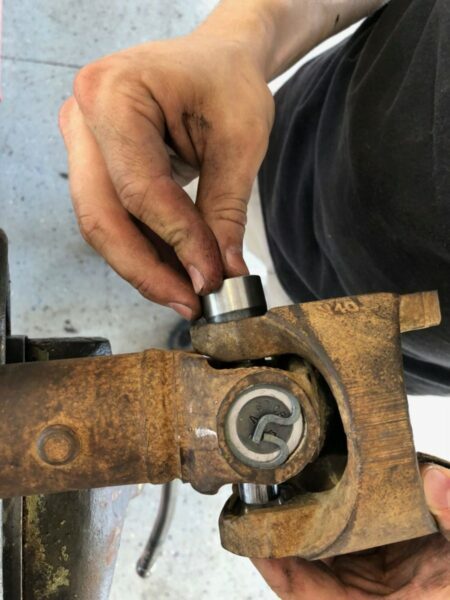 Use the u-joint tool to fully seat one of the caps. A properly seated cap will be recessed in the yoke, just enough to expose the groove for the retainer clip allowing the clip to fit in. 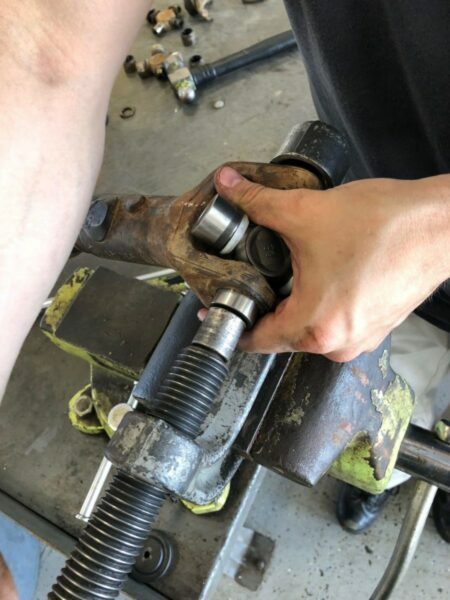 Overpressing, or essentially pressing back out the u-joint like you did during disassembly, can damage the seal on the opposite arm of the joint you are pressing. 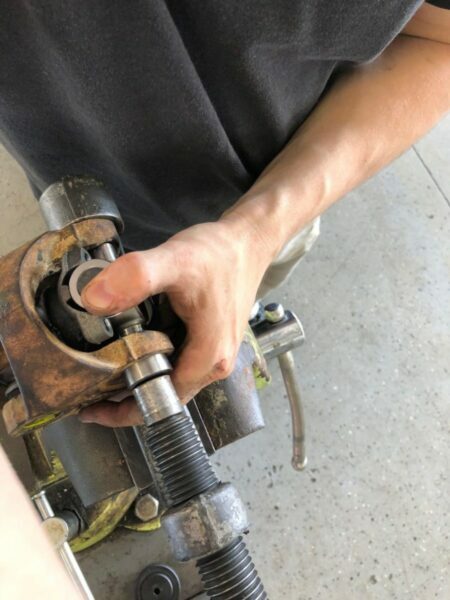 Another method or trick I like to use is to start to seat the cap with a non-marring vice. 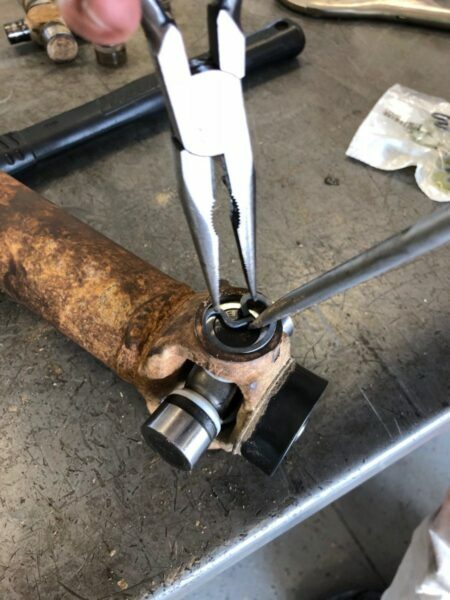 Then put a cap on the opposite side and do the same before following it up with the u-joint tool to fully seat one of the caps. 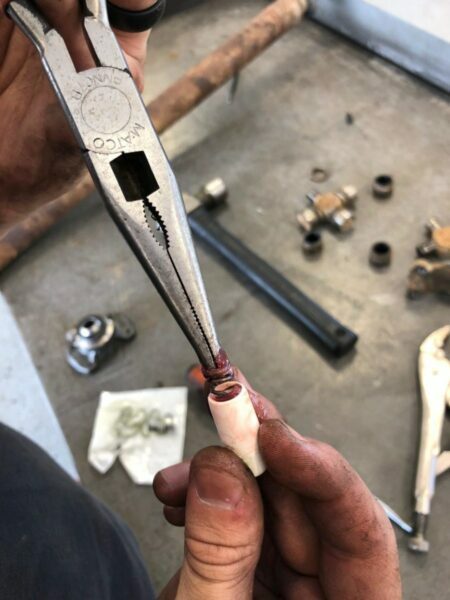 This method will get you the same results as just using the u-joint tool, I just find it easier to use a vice to press the caps on flush initially versus a u-joint tool even though it is an extra step. Insert the retaining clip into the groove of the yoke on the same side you just finished pressing the cap on. This will keep the cap from pushing back out when you press the other cap on the opposite side. Fully seat the cap on the opposite side and then insert the retaining clip. This will be a repeating process for all the rest of the u-joints. 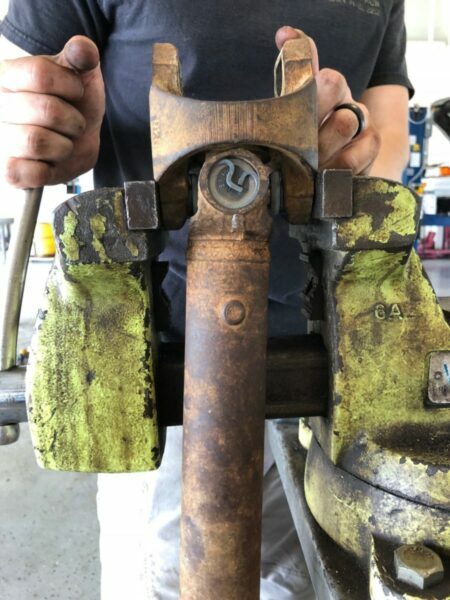 Remove the end caps from the u-joint you just installed place the H yoke over the stubs. Remember your reference markings to ensure you are putting it back together the same way it came apart so there are no balancing issues. 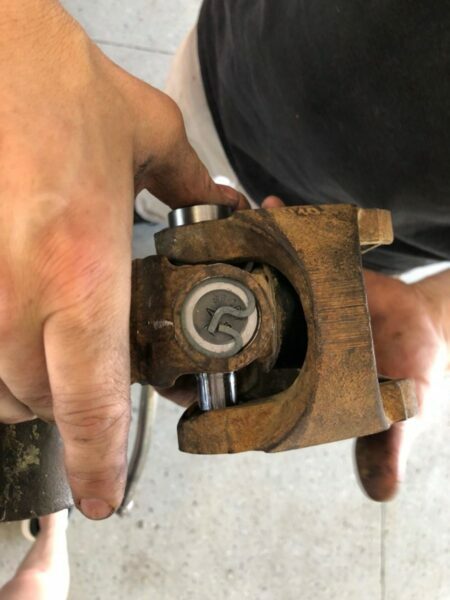 Place caps on u-joint stubs, press on and insert retainer clip. Do this for both sides and reference steps 13-15 if you need assistance. 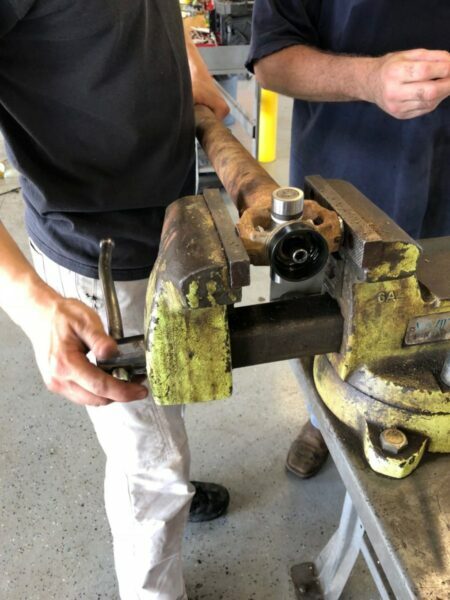 Place the spring and socket yoke into place in the H yoke. 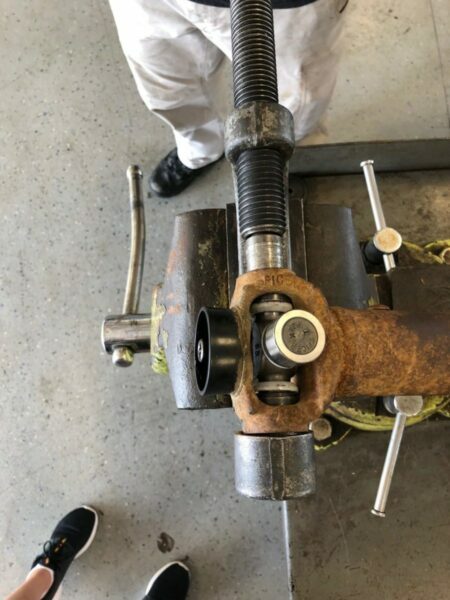 The spring should be able to be compressed resulting in a small amount of movement in the socket yoke. 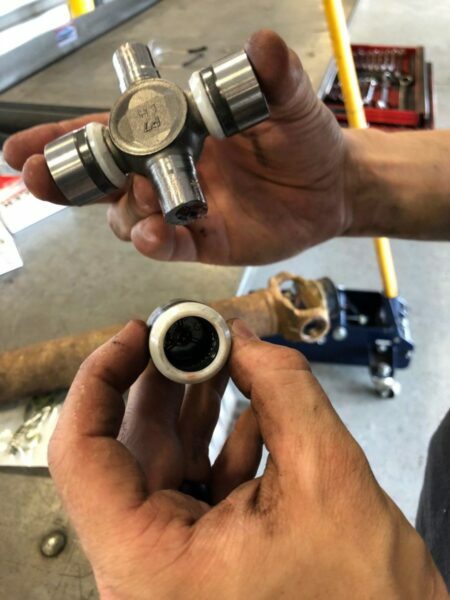 If you are putting in a new ball centering unit make sure to remove the rubber cap. 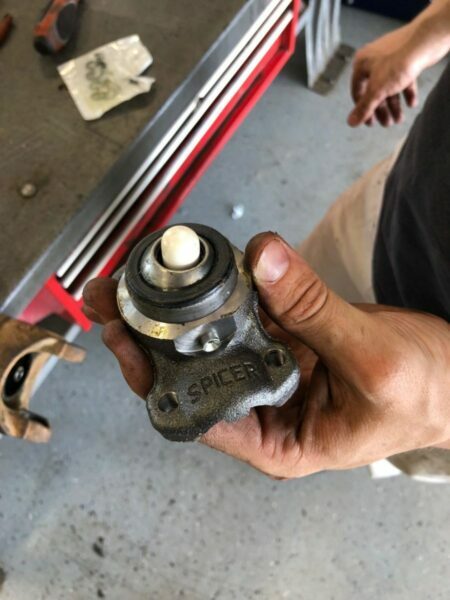 The spring may be stuck inside the grease in this cap so make sure to pull it out. 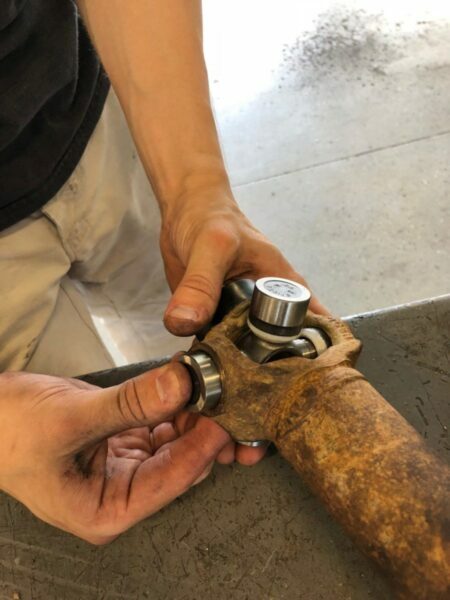 Remove two caps from a u-joint at opposite ends and then place the u-joint into the H yoke. 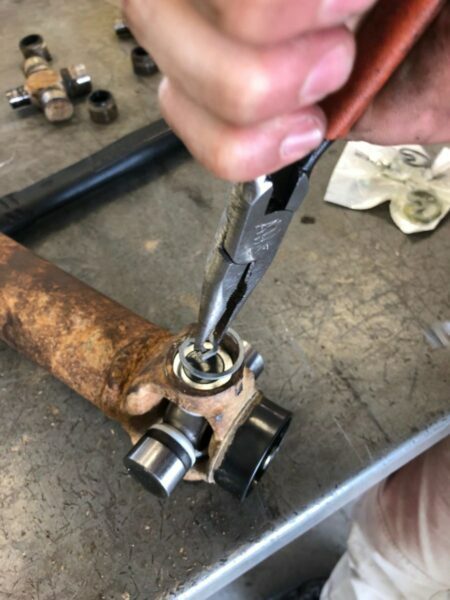 The caps will then be placed on the u-joint stubs very similarly to how you have previously done with the other u-joints but this one will be slightly more challenging because of the spring centering assembly applying outward pressure on this u-joint making it not want to center in the holes of the H yoke. 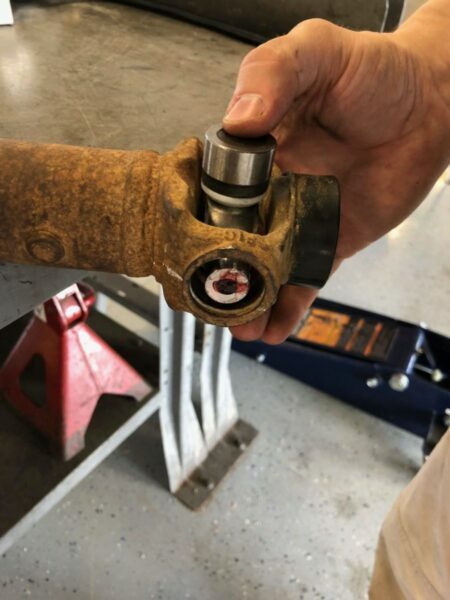 You can counter this by applying a firm amount of pressure on the center of the u-joint ensuring the stub of the u-joint is centered in the hole of the yoke, then carefully slide a cap on without dislodging the needle bearings inside of it. 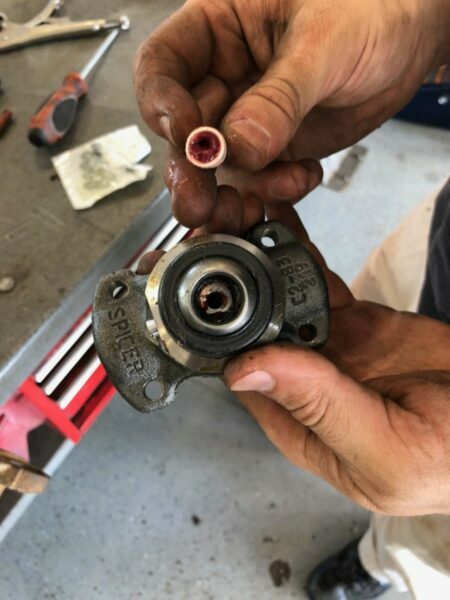 If you knock out or move a needle bearing then remove the cap, carefully place the needle bearing(s) back inside and flush against the wall of the cap and try again. 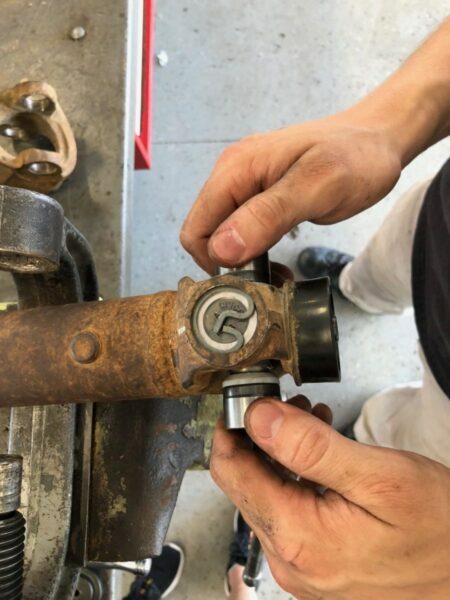 Finish installing this u-joint the same as you did with previous ones. 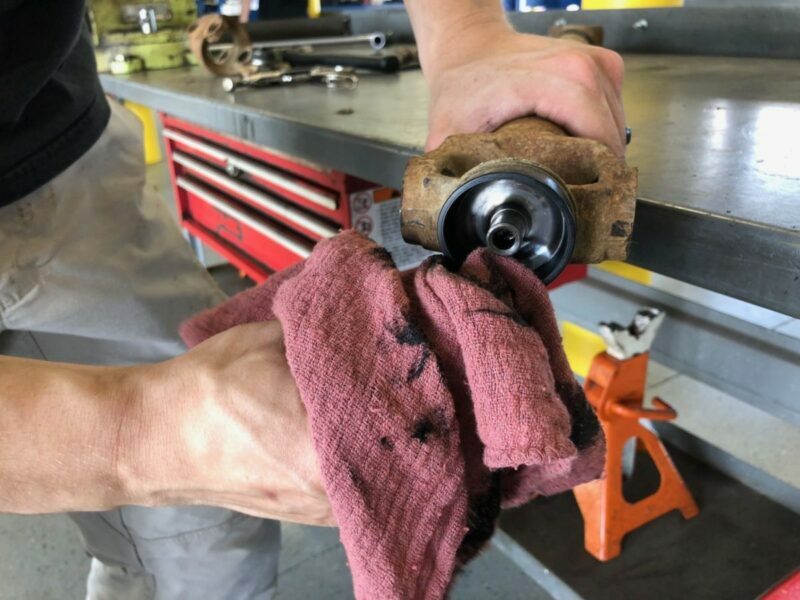 Reassemble the rest of the driveshaft in a similar manner. 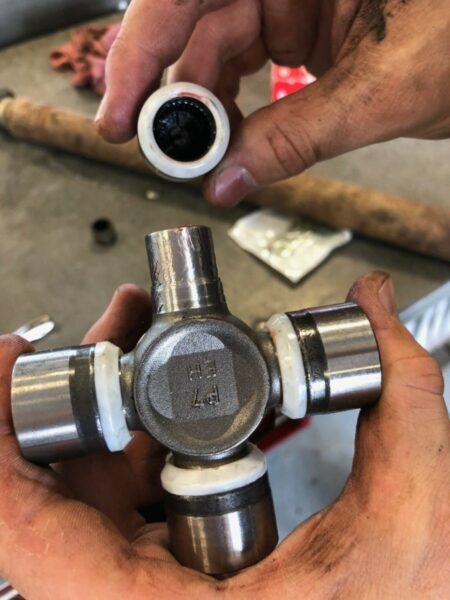 Any remaining u-joints will be much easier because you will not have the spring from the centering assembly applying outward pressure on the u-joint. 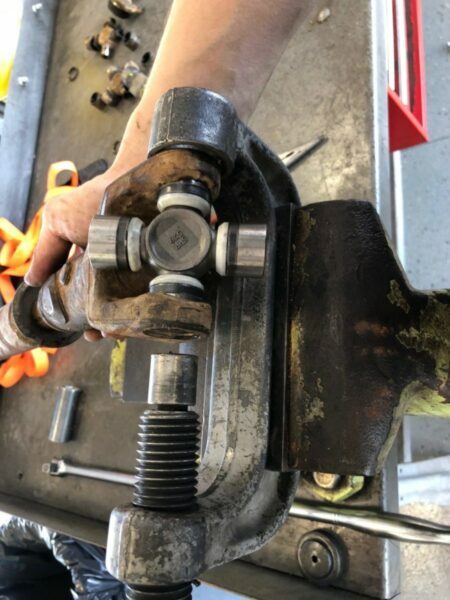 The order you install the u-joints in does not matter but once you are finished go back over them all to ensure all the caps are fully seated with their retaining clips installed. 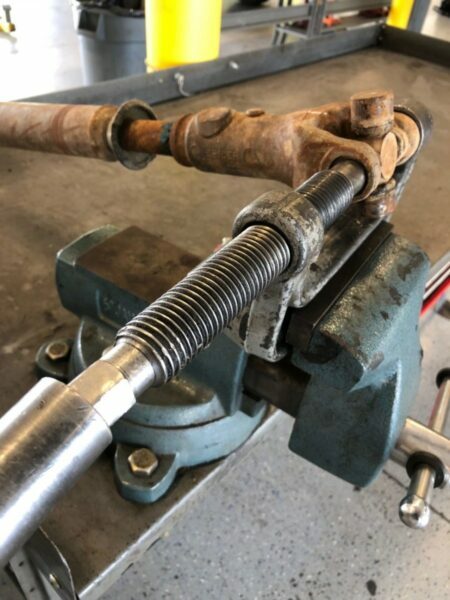 The last thing you want is to go through all this work only to have a cap fly off a few miles down the road because you didn’t take a couple of minutes to make sure the retaining clips were set in their grooves. 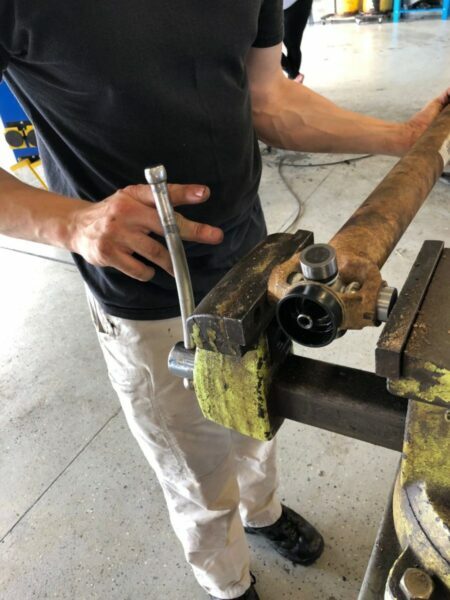 Install driveshaft on the axle side followed by the transfer case side. 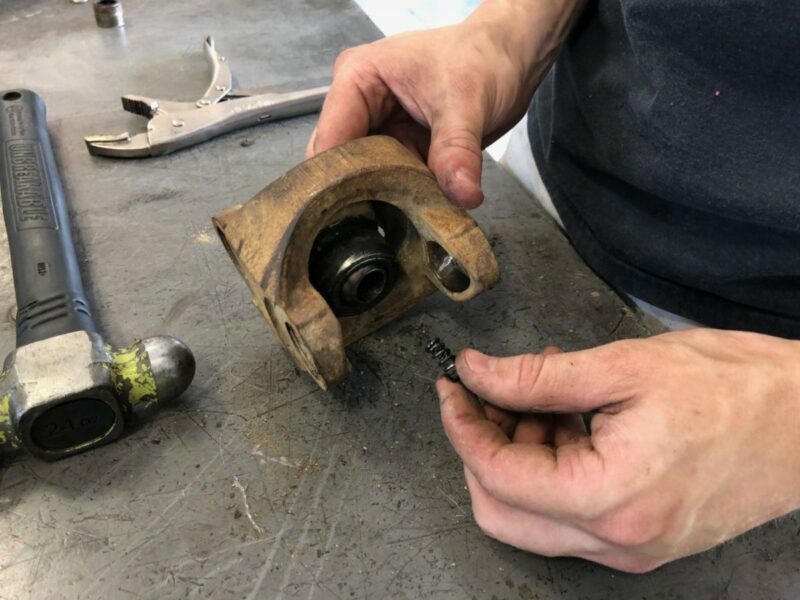 While the reference markings are not as vital here to balancing and vibration as when assembling the driveshaft itself, it’s far too simple of a step not to take in order to reduce the risk of a new vibration. 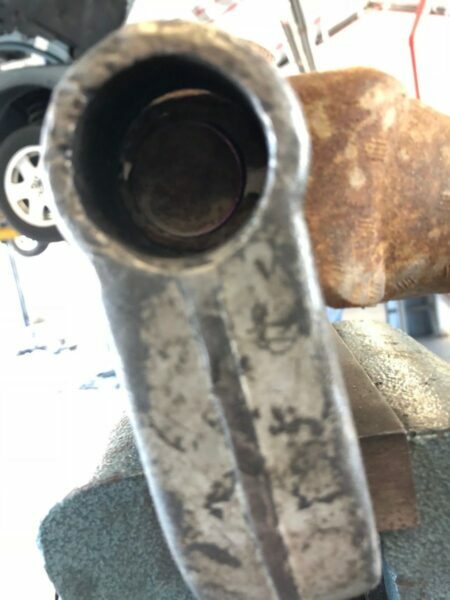 If this driveshaft has never been on the vehicle then don’t worry about it, as long as the driveshaft has been balanced you should be good. 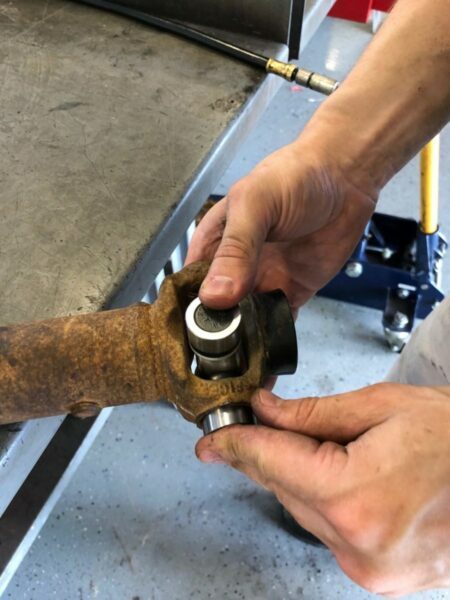 If the driveshaft has not been balanced and you need to use this driveshaft on your vehicle we recommend it only be used at low speeds. 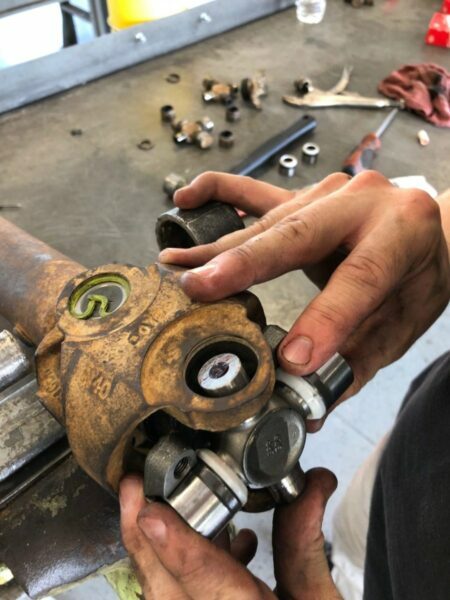 It should be noted that there are additional ways to disassemble and reassemble a driveshaft or u-joints other than using a u-joint tool. We do plan on adding those guides in the future so keep an eye on our page for more updates. If you think we missed anything or have any neat tips and tricks we should include please comment them below or feel free to email us. We are always learning here at 4WAAM and love getting your feedback. Well written and very thorough. This will definitely help me in the future. Excellent write-up! The pictures were awesome! Awesome write up ! Very thorough! Thanks for the excellent write up. 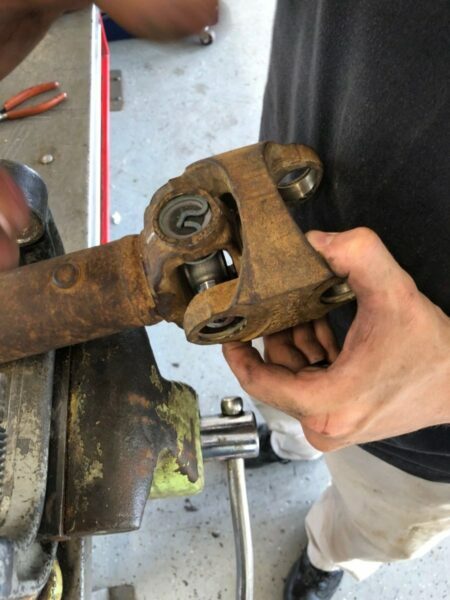 I replaced my front driveshaft and want to rebuild the old one as a trail spare. I’ll just follow the pictures. Love it. Awesome write-up and great detailed pictures. This should make it a lot easier to rebuild the front shaft. So easy a caveman could do it!